I recently heard a man say, “I feel as if I have dropped into my own life and it fits.” It made me smile. It was such a great description. I think we all want to be able to say that. He went on, however, to say that it wasn’t about his family, his work, or even anything he could specifically name. It was more about what was happening within him than what was happening around him. There are moments in our lives when our senses awaken and open to a greater reality, a larger world, a more whole life. Those are the moments when our seeing gives way to recognition and acknowledgment of a deeper and more profound reality. They are the moments of presentation, moments of meeting, moments when divinity and humanity touch, and heaven and earth are joined. That’s what this day, the Feast of the Presentation of our Lord in the Temple, is all about. In those moments we are living today’s gospel (Luke 2:22-40). In those moments we catch a glimpse of what Saint Simeon saw. We stand in his shoes and we see with his eyes. We’ve all had those moments. Now we probably don’t say, “Oh, wow! Look! Heaven and earth are joined, humanity and divinity are touching.” No, we say it differently. Nevertheless that’s what’s happening. Think about a time when you said aloud or maybe to yourself, “I never want this moment to end.” That wasn’t about the passing of time. It was about presence. You were fully present to the moment. You were acknowledging that somehow all the pieces of your life fit. There was an integrity and authenticity about you and your life. There was a reality greater than the circumstances of that moment. How about this? Have you ever been so immersed in the presence of another person, your work, a hobby, a conversation with a friend, that you lose all track of time? We look at our watch and wonder, “Where did the time go?” I’m not talking about time that was wasted but time that was full and complete. In those minutes and hours we had softened and opened ourselves to the eternal. Maybe you’ve experienced it this way. You look back on a particular time in your life and think, “I don’t know how I got through that. I didn’t think I would. I didn’t think I could.” You don’t know how you got through that, you only know that you did. That was a moment of presentation, a moment of meeting with a presence greater than yourself. In all those and a thousand others like them it seems as if that moment is presenting itself to us but I think it is just the opposite. We are being presented to the moment. God’s Spirit guides and takes us to that place of meeting. We see that moment but not with our eyes. We hold it but not with our hands. We taste it but not with our tongues. We smell it but not with our nose. We hear it but not with our ears. We meet a presence greater than what our physical senses can experience or understand. That’s why this man I just told you about couldn’t name what was going on, what had changed, only that it had changed and he was somehow different. He wasn’t just living. He was alive. Simeon saw more than just a child. He looked at the child and he saw salvation. He saw the fulfillment of God’s promise. He saw the Lord’s Messiah. He saw the Light of God’s glory. He saw the freedom to go in peace. He saw the fullness of his own life and it fit him perfectly. 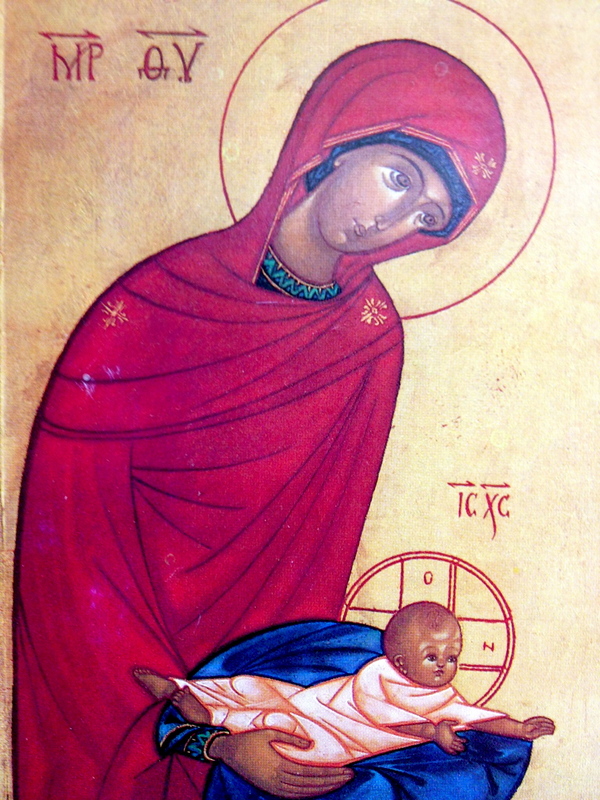 On this Feast of Meeting, as it is sometimes called, Mary, called Theotokos in Greek, it means God-bearer or God-birther, would place her son in the hands of the old man Simeon. He had been waiting for this moment all his life. It’s why he went to the temple on this day. 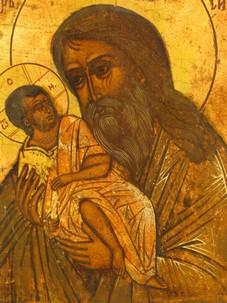 Guided by the Holy Spirit, Simeon was being presented to the child he would hold. In that presentation and in that holding Simeon would be Theodochos. It’s Greek and it means God-receiver. Simeon is the God-receiver. Who among us doesn’t want that? Who here doesn’t want to be Theodochos, a God-receiver? At some level that’s what we’re all searching for. It’s our heart’s desire and the longing that drives our life. Whether we know it or not that’s why we’ve shown up here today. We want to hold the child. We want to be presented. We want to receive God. We want to see our salvation and know the fulfillment of God’s promises in our own lives. We want to be set free to go in peace. We want to try on our life and discover that it fits. Today is not just for or about Simeon. It is also for and about us. This is our day. All of us have the possibility of becoming God-receivers. All of us are intended to be God-receivers. The light Simeon sees is not just for himself but for the nations, all the peoples, you and me included. There’s something you need to know about Simeon, however. Our sacred tradition says that when all this happened Simeon was 270 years. There’s something else you need to know. Our sacred tradition also says that he was blind. So what do we do with that? A 270 year old blind man that sees? How can that be? We might say that that makes no sense. It cannot be. Nobody lives to be 270. He is either blind or sighted. He can’t be both. At a factual level we would be right. What if, however, we don’t try to resolve the factual inconsistencies? What if, instead, we let this paradox be the doorway into the temple of our own life and another way of being, another way of seeing, another way of knowing? Surely that’s what Simeon had to do. If we think we struggle with this paradox imagine Simeon’s struggle. God had promised him that he would not die before he had seen the Christ, the Lord’s Messiah. What did Simeon think when he turned 100, 150, 250 years old and still had not yet seen the Messiah? What did he think when he went blind and could no longer see with his eyes? The truth of this story and the fulfillment of God’s promise, for Simeon and for us, do not depend on resolving the factual contradiction. They are found in the paradox. We spend so much time and effort trying to make life fit by resolving the facts and controlling the circumstances. Simeon didn’t do that. Maybe we shouldn’t either. He showed up at the temple knowing he was blind and believing he would see. That was enough for Simeon and it was enough for God. Let it be enough for us. Step into the paradox of a 270 year old blind man that sees the Christ and you will see the invisible, hear the unspoken, smell the odorless, taste the uneaten, and touch the intangible. Those are the sights, the sounds, the fragrance, the taste, and the feel of a life that fits, a life in which heaven and earth are joined and humanity and divinity touch. Try it on for size. Drop into your life and discover that it fits. Such a coincidence for me to read your post today. Your invisible nearness – the story of a lingering fragrance. Julien that’s a great image – “the lingering fragrance.” I also really like your insight, “There was no distinction between me and Living.” Perhaps that’s what Jesus meant when he said, “I am the way, the truth, and the life.” We become life itself. I made some typos, I am to be excused, I wrote too fast as I didn´t want to lose the idea. The feeling of dropping into one’s own life is one I recognize though I wouldn’t have thought of expressing it that way. It’s been a year to remember – mini stroke, fractured hip, a move from our home to an independent living facility, watching my husband become more frail and more confused, facing a 90th birthday. Yet, without any effort on my part to become tougher or more accepting, I find myself happy, even joyful, in love with life whatever it throws at me. God has been with us through family and more friends than I ever knew we had but He is also here in his indwelling spirit. Betty, you have seen salvation! Thanks be to God. Thank you for reading my blog and for your beautiful comment. I will remember you and your husband in my prayers.